I hear his sharp, startled cry. It’s only been half an hour since I cradled him and tucked him into his baby bed for the night. This awakening is unexpected. I slip into his room and its deep darkness. Even though I can’t see his tiny frame, I hear him squirming, kicking, tossing his face side to side searching for me and calling out for rescue and help. The floor creaks under my footstep and he ceases the cries, lies still for a moment, just waiting for Mommy to reach in and scoop him up into arms that will soothe and fix and comfort. He knows I’m there even though he can’t see me. And for the moment, that’s enough. Soon his muscles relax and his head droops down onto my shoulder. His breathing slows and deepens. Still, I sway back and forth in the darkness and quiet, cuddling this infant blessing, not ready yet to move and let go. And I’m thinking about this. After just three months of life with me, my son calms simply at the creaking floorboards that announce my presence in the room. I don’t have an infant faith or a 3-month experience with my Savior. Thirty years into this faith journey, still I scream and thrash and demand attention and rescue even when I know He’s with me, even when He’s assured me of His presence, even though He’s never once failed or abandoned me. 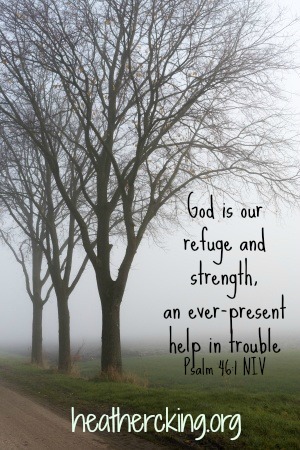 an ever-present help in trouble (Psalm 46:1 NIV). Ever-present. That’s what our God is. He’s with us. Even before He lifts us out of the pit, we can hear the creaking of His footsteps nearby and know He’s there in the darkness. Therefore—-because He’s always there—-we need not fear, no matter what rumbles and falls to pieces around us. Even if the foundations of the earth shake, He is our unshakeable Foundation. the God of Jacob is our fortress (Psalm 46:7 NIV). Be still and know that He Is God. 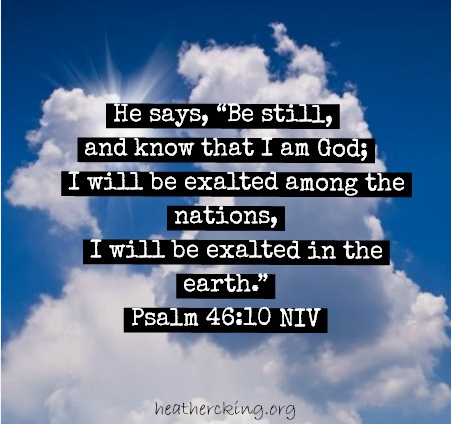 He will be exalted. In the midst of any darkness, in any storm, in any crisis or struggle or pain, He will display His glory through the rescue and redemption of His children. Those Psalm-writing sons of Korah say it again. Maybe they know we struggle to understand. Maybe they know that a three-month-old baby can trust his imperfect Mama, and yet we’ll fail to trust our perfect God. the God of Jacob is our fortress (Psalm 46:11). It’s not just the earthquakes and battles that make me question His presence sometimes. It can be as simple as the overwhelming rush of my minivan life. But there, yes, even there on the busiest of breathless days, The Lord is with me and it’s His presence that gives me peace. As I lay my sleeping baby boy back down in his bed, I find myself singing an old hymn, a favorite that I’ve sung through some of the hardest times of my life. It’s a song I’ll be singing all month long as I pursue the presence of Christ by being still and knowing He is God. What songs do you sing when you’re scared or overwhelmed and need to know God is with you? His voice Who ruled them while He dwelt below…. I constantly need this reminder! I’m thankful I have little ones to keep reminding me all the time! !